Rachel Levy, Associate Professor of Mathematics at Harvey Mudd College, was awarded the Henry L. Alder Award for Distinguished Teaching by the Mathematical Association of America. Her research focuses on applications of mathematical fluid dynamics to biological and industrial problems. Professor Levy is Editor-in-Chief of SIAM Undergraduate Research Online (SIURO) and the creator of “Grandma Got STEM,” a blog celebrating the achievements of women in Science, Technology, Engineering, and Mathematics. You started Grandma Got STEM to “counter the implication that grannies (gender + maternity + age) might not easily pick up on technical/theoretical ideas.” Each post has at least one image and a story; what are some of your favorites? My favorite posts are written by the women themselves or by people learning and writing about relatives. The personal stories and connections mean the most to me. 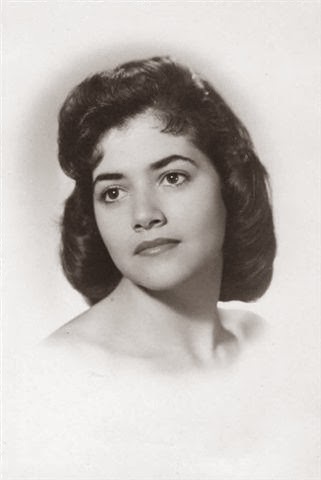 Her mother went on to become a professor of Computer Science, Mathematics and Mathematics Education and was later identified as the first Hispanic woman in the US to get a PhD in Math and Math Ed. One of my favorite pictures is of Maria Dee Salmonson, the great-grandmother of Aurora Pribram-Jones. Salmonson was born in Semarang in Java sometime around 1889, came to the Netherlands as a toddler, was a nurse for the Dutch Red Cross and ended up in Vienna during World War I, where she met Aurora’s great grandfather. 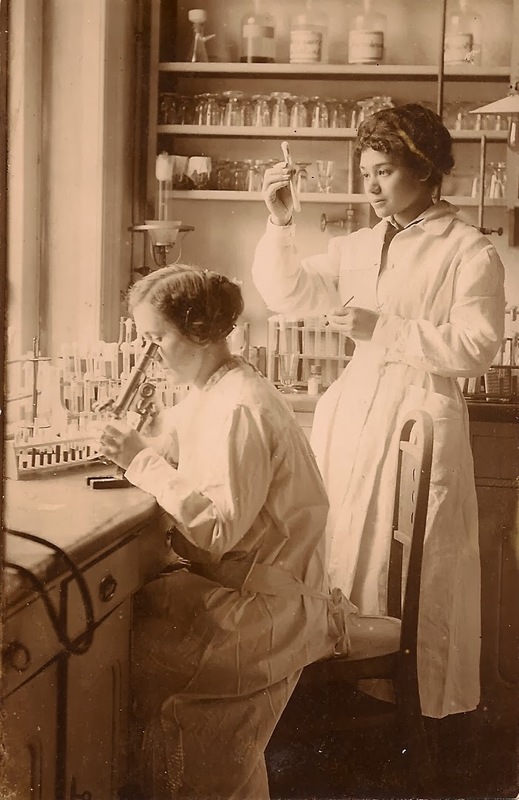 The picture is of two women in a lab with lots of glassware. One is looking through a microscope and Aurora’s grandmother is holding up a test tube. Aurora wrote that she never saw the picture of her great-grandmother until she was a senior chemistry major at Harvey Mudd College, after which point she kept it framed over her desk for inspiration. I like the idea of highlighting ordinary successes. Some of the women in GGSTEM are truly extraordinary, but I also love the posts about women doing ordinary, good work. I believe that there are many ways to do important work. Accomplishing almost anything of magnitude takes a team effort. Instead of “standing on the shoulders of giants” I like to think of great advancements in STEM fields as the result of many efforts, contributions, collaborations, failures (iterations) and tiny steps. For example, we support research funding when we pay taxes, so taxpayers make an important contribution to the advances that come from that work. In addition to Grandma Got STEM, you like to facilitate hands-on outreach activities that help people experience what mathematicians do. Could you describe one of these projects? Lately I have been thinking about mathematical modeling and how it can play a role in the elementary school curriculum. Mathematical modeling is much more than solving word problems – it is more like engineering or science, where you start with a problem or a question and develop mathematical approaches to help you understand a real situation. For example, you might ask a class of students to determine a metric (a single number) to determine which pizza company provides the best value. The class could decide how to model value based on a variety of factors such as quantity, price, flavor, convenience, available toppings, quality of ingredients, gluten-free options, fresh/frozen, delivery time, etc. Different groups might develop different metrics. They could also weight different factors based on which ones are most important to the customers. They could make a customized recommendation based on the answers to a customer survey. It would be fun to see whether different metrics would come up with the same conclusion for a given customer profile. Then the class could have a pizza party, of course. I also work with student groups to help them understand the mathematics of surface tension through an activity I call “soap and slope.” Soap lowers surface tension, and changes in surface tension can make fluids move. You can move a boat or pepper on the surface of some water by adding a drop of liquid dish soap! This activity relates to my research on the mathematics of surfactants, which lower surface tension. Because dish soap is a surfactant that is safe and fun to explore, I can use this common household item to talk to groups about what my undergraduate research students at Harvey Mudd College do with mathematical models and what kinds of experiments they conduct in the lab. How did you first become interested in math? Were you encouraged to pursue a career in the field? I can’t remember when I first became interested in math, but I remember doing mathematics with my Dad. He made it fun like a challenging puzzle, and through elementary school I was allowed to work at my own pace, so I was not bored. Junior high school was another story. My seventh-grade guidance counselor told me that girls can’t do math and science, but luckily my parents called those comments stupid. Despite my positive experiences with mathematics, I never dreamed of becoming a mathematician, and set out to become a teacher. After teaching middle and high school for eight years and earning a master’s degree in Educational Media and Instructional Design, I finally decided to pursue a PhD in Mathematics. It took a lot of courage to begin the PhD program, but it was a very good experience and has led me to one of the best jobs in the world! I had a terrific mentor, Prof. Michael Shearer, who encouraged me and helped me believe that I could become a mathematician. I want to emphasize that both men and women can be fantastic mentors for female students. What can parents and teachers do to encourage more girls to go into STEM fields? I think it is important for girls to know that it is OK to fail, especially if they are working hard. That may sound strange, but in order to do STEM, you have to be willing to try and fail and try again. It takes a lot of perseverance and sometimes stabbing in the dark and being willing to play in the unknown. You don’t make new discoveries by doing exactly what someone else has done, but you can get experience and inspiration from others. Learning to deal with open-ended problems (I think mathematical modeling is great for this!) can provide invaluable skills for STEM careers. Communication and teamwork skills are also helpful in almost any job. I think STEM-based camps can be great places to gather kids interested in working on problems together and also provide more time for creative thinking than schools sometimes can afford. I think it is really important for kids to explore and follow their creative and intellectual passions, which may change over time. Maybe a last thought is to have toys that provide opportunities for playing in STEM. For example, the hardware store has lots of fun mechanical items (locks, hinges, etc.) and the kitchen has lots of chemistry going on. There are lots of ways to use mathematics to understand the world and make decisions. Make STEM discussions playful and ordinary. Encourage curiosity about the world around us. One aspect of teaching that especially interests me is identifying and reducing misconceptions. Rather than only tell students what is true, I try to see how they are thinking about an idea. If they took an approach that didn’t work, I try to understand what assumptions they made that led to that approach. Here’s an analogy. If you are at a fork in the road and both options look good, then you might feel stuck or give up and just guess. I think students who feel discouraged in mathematics are often facing these situations. If I just say, “go right” you won’t know why you should not have gone left. Students need to learn the mathematical signals and signs that indicate which paths are likely to be more useful than others. When a student is inclined to take a wrong path, I have to understand how they were interpreting the signs, so that they can learn to see why that path is not mathematically advantageous. Then we can talk about how to follow a useful path. My hope is that by taking this approach, then the next time they approach a place they feel stuck they can start looking for signs. I also want students to understand that sometimes you just have to try one path and be willing to back up and try another path if the first one does not work out. In research the “right” path is rarely obvious, and if problems in school are too easy and obvious, students will be unprepared for genuine pure and applied mathematical problems. It is tempting to have students practice many of the same kind of problem right after teaching a method, but the student may not transfer those ideas to a new context. Once students have practiced a skill, I try to address this issue by asking open-ended questions and by creating situations where students must make genuine choices. Some of my early teaching experiences were at Carolina Friends School, a Quaker School in Durham, NC. At the school I learned about the power of silence and the consensus process. Silent reflection can play an important role in learning and personal development. Quaker practices affect the way I conduct meetings, face difficulties, and think about decision-making processes. The philosophy also affects the way I think about students – there is a light in each one of them and it is my job to help that light shine. Thank you for the opportunity to share these ideas. I hope some of your readers will encourage girls to interview senior women in STEM fields from their community and become GGSTEM reporters! I welcome their submissions. THANKS for this post. Rachel Levy's blog is a great resource and a great read. Thanks for your comment, JoAnne, Grandma Got STEM is a great resource, isn't it? And I wish I'd had Rachel Levy as a math teacher!